Thermo forming is a manufacturing process whereby a plastic sheet is heated to a pliable forming temperature, then formed to a specific shape in a mold, and trimmed to create a usable product. 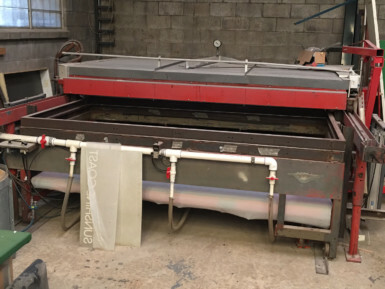 The sheet is heated in an oven to a temperature where it can be stretched into or onto a mold and cooled to a finished shape. In its simplest form, a small tabletop or lab size machine can be used to heat small cut sections of plastic sheet and stretch it over a mold using vacuum. This method is often used for sample and prototype parts. In complex and high-volume applications, very large production machines are utilised to heat and form the plastic sheet and trim the formed parts from the sheet in a continuous high-speed process, and can produce a multitude of parts depending on customer requirements. The most common mold materials are aluminum, epoxy and wood (MDF). The material is held against the mold surface and slowly cooled. The vacuum forming process is relatively simple, achieved by heating desired material to a temperature where it can be formed over a mold with a high vacuum. Common materials used in vacuum forming are acrylic (or perspex), ABS, Hips, high impact acrylic, polypropylene and ASA. © Asap Plastics 2016. All rights reserved.